I made this cake for charity for the FOP Charity Police Auction. 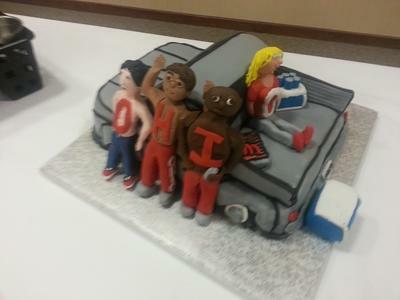 It was auctioned off for charity and the theme was Ohio State Buckeyes Tailgating. I wanted to really capture the essence of tailgating with the crazy fans and foods and such. So I decided to do 2 coolers, a grill, 4 crazy fans that have O-H-I-O on their chests and a cool old ford truck. I decided to do the truck in silver and the little people wearing a lot of red. I did the cake white raspberry with dark chocolate ganache and an almond icing and vanilla fondant. I carved the truck and covered it in fondant. I did all of the seams of the truck with a fondant extruder and I also sprayed it with a sheen to look like metal and added the windshields. 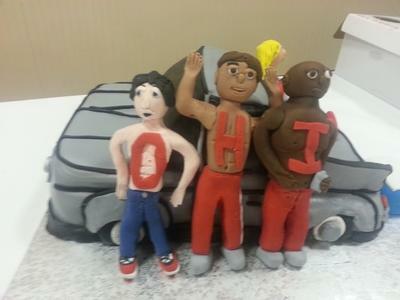 The people were hand modeled out of fondant with tylose. I also made the grill with little hot dogs and hamburgers out of fondant and had a little set of beer cans on top of one of the coolers. This cake took me 8 hours to make and it was auctioned off in the auction. It was a big hit with Ohio State Fans and even the Buck-I-Guy (one of the local Ohio State Mascots) got to see it and loved it. Thanks for looking! Return to September, 2012 Cake Decorating Contest Submission Form.